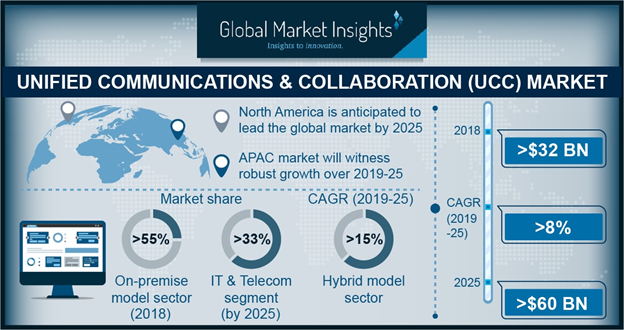 Unified Communications & Collaboration (UCC) Market size is set to exceed USD 60 billion by 2025; according to a new research report by Global Market Insights, Inc. The unified communications & collaboration market growth is attributed to the growing penetration of mobile devices and increasing adoption of BYOD trend across enterprises on a global scale. Over the last 10 years, mobile devices have evolved from just a means for voice communication to a smart device with sophisticated multi-function capabilities. With extensive investment being made by telecom players on developing and commercializing advanced telecom network technologies, the internet usage on mobile devices, such as smartphones and tablets, is likely to increase swiftly over the forecast timeline. As upgrading traditional communications network and infrastructure becomes highly challenging in a rapidly evolving business environment, enterprises are becoming more inclined toward cloud and hybrid UC solutions to scale & manage communication resources. An expanding global cloud eco-system is also expected to boost unified communications & collaboration market growth over the timeline. With traditional phone services that operate on on-premise equipment or copper wiring, scaling the phone systems up or down becomes tedious. Using cloud-based UCC solutions and adding extensions, new phone lines & other features are entirely simple. Also, most cloud service providers offer a Service Level Agreement (SLA) along with their services that outlines the reliability & quality of services that the customers expect. Telephony platforms are expected to hold a significant market share of around 29% by 2025 owing to large-scale deployment of telephony applications across enterprises in various sectors as a primary communication medium to enable real-time business communication. The IP phones segment will secure a larger share of the telephony market over the forecast period as it has numerous benefits over analog phones and cost much less than traditional telephone services. As IP phones transmit data over the internet, enterprises can stretch their communication infrastructure practically anywhere on the planet, provided they have internet connectivity. Also, they are much easier to install and configure compared to traditional phone systems. The cloud-based UCC market is expected to exhibit excellent growth between 2019 and 2025 with a CAGR of over 10% owing to the growing popularity and adoption of cloud computing technology across businesses in varied sectors ranging from IT & telecom, BFSI, healthcare, and public services. The hybrid model will experience accelerated growth during the timeline. As the framework gives cloud capabilities along with secure on-site storage of critical data, the model is witnessing rapid adoption by enterprises wanting to implement UCC systems. The IT & telecom UCC market is expected to hold a majority share of the overall market by 2025 due to high adoption and immense applications of the technology for process flows in the industry. Effective team collaboration and robust network availability are some of the key requirements of the enterprises operating in this sector; hence, UCC technology is witnessing high acceptance from such enterprises that operate on an extensive global scale. With rising proliferation start-ups in the IT sector, the demand for cost-effective UC capabilities will increase over the forecast period to reduce expenditure on IT infrastructure procurement, maintenance, and advancements. SMEs in the unified communications & collaboration market can largely benefit from the scalability and flexibility offered by cloud-based UCC solution providers. They can dynamically scale their communication infrastructure depending upon their changing infrastructure requirements without paying for procuring costly infrastructure components. This way, they can increase their ROI on communication systems while enabling an efficient enterprise communication framework for their employees and customers. North America will dominate the UCC market by 2025 primarily due to the availability of a robust telecom and cloud infrastructure in the region. Also, extensive support for BYOD and readiness to adopt the trend by the U.S. enterprises will positively contribute to the market growth. The Asia Pacific market is expected to grow with the highest CAGR of over 12% between 2019 and 2025 due to increasing demand for better business communication infrastructure by organizations operating in emerging economies in the region. Also, large-scale digitalization initiatives undertaken by government agencies in China and India are expected to contribute to the rising uptake of UCC solutions in the region. As technology outsourcing has been a traditionally major trend in these countries, establishing efficient enterprise communication infrastructure is one of the key priorities of the companies offering outsourcing services to the European and North American enterprises. The players operating in the UCC market include pure providers, such as Avaya, 8x8, and Unify, along with software providers such as Microsoft, Cisco, Verizon, and ALE. The major strategy adopted by the key market players is strategic collaborations and partnerships. Such undertakings enable them to enrich their existing product portfolio and further expand their presence in different regional markets. Furthermore, strategic acquisitions also play a key role in the consolidation of the highly mature market as the major players are striving to extend their global presence and gain more market share.